Can you believe 2011 is gone? I was thinking about what I wanted to do for my last blog post of the year, and it brought to mind the “last shot” page at the end of National Geographic magazine where they showcase an image that wasn’t published but was still a cool picture. So I decided to share some of my favorite images that didn’t make the blog. It’s always hard for me to pick which pictures best sum up a wedding or photo shoot best, without making the post too long. Some of these did end up in Facebook galleries, some of them I never got the chance to share at all. (BTW – one of my resolutions for 2012 is to get back to timely blogging since I was not so good at that this year). So enjoy this 2011 Steely Joe version of the “Last Shot” gallery, and HAPPY NEW YEAR! Alizabeth won a free bridal session at one of the spring Bridal shows. She had already made arrangements for wedding day photography, but it was still lots of fun doing some studio bridals with her. I never did a blog post with her Bridal portraits, but you can see more images from her session in the Facebook gallery Alizabeth’s Bridal Session. Continuing with the bridal portrait theme, Kathryn’s bridal portraits in Bentonville were fun to shoot even if it was literally 110 degrees out! (Ok, I exaggerate – it had dropped to a cool 106 by the time we started the session) You can see more images from this shoot in the Facebook gallery Kathryn’s Bridal Portraits. Kathryn was such an easy bride to work with, and this great little series of images was taken as test shots while she talked to her mom off-camera. The next two images comes from two fun weddings this summer, Abby and Adam’s wedding in Lowell, and one more from Sanchez and Bobby’s wedding in Little Rock. Right: Abby and Adam cheese it up. Left: Sanchez gives herself one last check in the mirror before the ceremony. In the first image below, Lensa and Lee dance alone surrounded by family and friends. Although I was just a guest at this wedding, I couldn’t help taking a few pictures from the balcony. The second image is from Nancy and Tony’s wedding at Lake Wedington. Left: A beautiful moment on the dance floor at Lensa and Lee's reception. Right: The bride reaches up to wipe a tear from the groom's face during Nancy and Tony's ceremony. This year I decided I would love to do senior portraits as well as wedding photography. I couldn’t have asked for more fun ambassadors. They all had great ideas and a unique style that was so great to work with. In the collage below, Katie rocks her class ring, Jordan proves you can never have too many flowers in your portraits, Aaron takes aim with his bow, Jessie shows off her lime-green laces. My awesome senior portrait ambassadors for the class of 2012: Katie, Jordan, Jessie, and Aaron. I would like to take a moment and thank all the super-cool clients I had the privilege to work with this year. You constantly re-affirm why I love to do what I do, and I can’t wait to see what next year has in store! Categories: bridal portraits, portraits, Seniors, wedding photography | Tags: bridal portraits, bridal session, northwest arkansas, senior portraits, wedding photography | Permalink. Thomas and Kathryn were married on July 23, 2011 at Mildred B. Cooper Memorial Chapel in Bella Vista. Luckily this was a morning wedding, as it landed right in the middle of a record-breaking heat wave here in Northwest Arkansas. I thought it was kind of ironic that the couple who currently holds my personal record of coldest engagement session is now also the hottest wedding day I have shot on! We did the bridal session at Bogle Park in Bentonville to showcase Kathryn’s amazing Lazaro wedding dress a week before the big day (you can see more of the bridal portraits on my FB page). The wedding itself was really beautiful, with a color scheme of purple, ivory, brown and yellow. The decorations for the chapel (which doesn’t need much since it is so pretty on its own) were kept simple with sprays of white hydrangea and orchids. The reception was held nearby inside Papa Mike’s at the Kingsdale Golf Course. Papa Mike (aka the brides father) closed the cafe for the day to convert it into an intimate reception hall for his daughter. The decor was a cheerful mix of burlap, simple flower arrangements in mason jars, and paper lanterns hung from the ceiling to match the color scheme. Each place setting also got custom paper bibs in order to fully enjoy the delicious barbecue served by Papa Mike’s catering. Rick’s bakery made the beautiful wedding cake that perfectly fit the simple yet elegant style of the event. Can I just say that you don’t often see a bride and a dress this beautiful every day?! 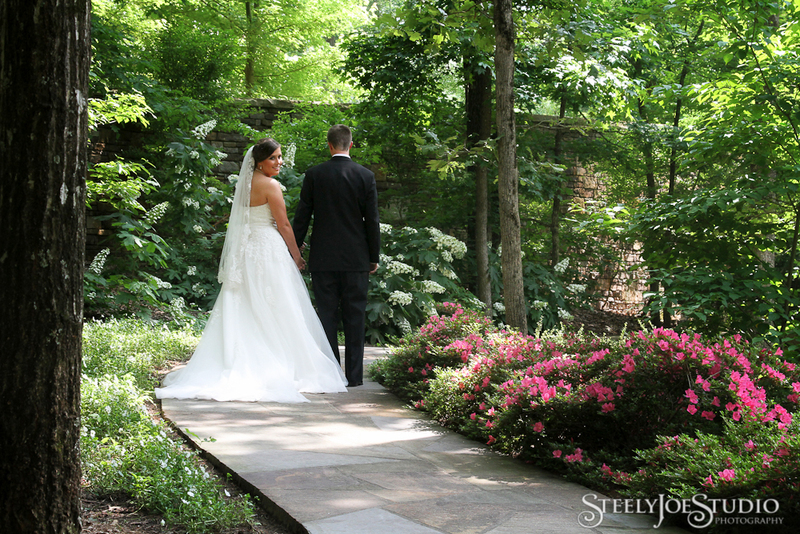 We did the bridal portraits in Bogle Park near the Bentonville Square. Getting ready in the office at Cooper Chapel. I like how many layers of helpers you can see in the pic on the right. This dress wasn't exactly easy to get on 😉 Shirley's Flowers did the purple bridal bouquet. Beautiful chapel filled to capacity - check. 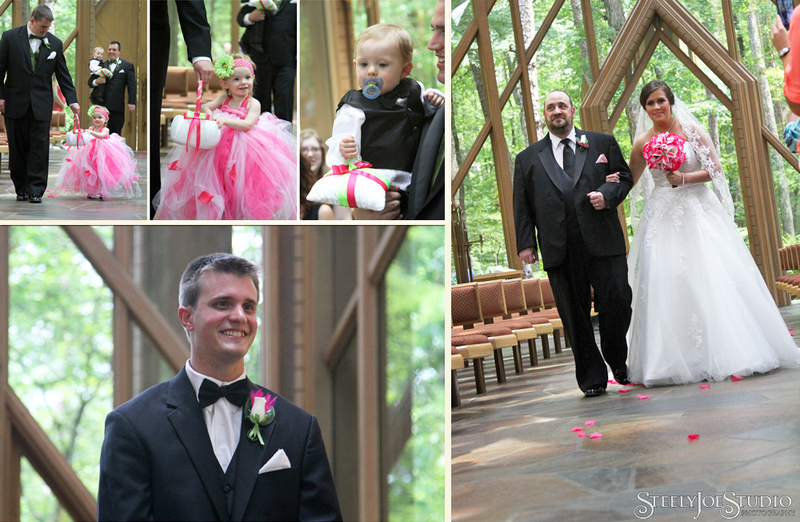 Adorable flower girls and ring bearer - check. Live string quartet playing - check. And just outside the door you can see the bride arrive on her father's arm. Perfect! BTW - the cool shot on the left is one of Ed's. I can't pass up a chance to brag on him! A beautiful ceremony for a couple who have been planning this day for a long time. Congrats! They say most human communication is body language. It was very sweet to watch the bride and groom's hands while they watched the minister sign the marriage licence. Look how tight Thomas is holding her hand! And I love the really romantic vibe of the image on the right. I love how this image turned out! Middle of the day portraits can be tough but having a great assistant (Ed) and an easy to work with couple really helps. Some of the details from the reception. Kathryn made the banner that hung over the head table herself! Each place setting included a paper bib for keeping the excellent bbq sauce off good clothes and a glass to toast and take as a favor. The beautiful tree branch wedding cake from Ricks Bakery, and a cool picture of the wedding rings on a Gerber daisy in one of the table arrangements. Thomas and Kathryn had a wonderful idea instead of a bouquet and garter toss. They gave them to the couple who had set the best example for them by being married the longest! 65 years later, he still carries a picture from their wedding day. Thomas and Kathryn, you have been a pleasure to work with and I wish you guys all the best! Categories: bridal, bridal portraits, Uncategorized, wedding photography | Tags: beautiful bride, Bella Vista, Bentonville, Bogle Park, bridal portraits, bridal session, DIY wedding, Mildred B. Cooper Chapel, northwest arkansas, NWA, purple brown and cream wedding colors, summer wedding, wedding photographers | Permalink. 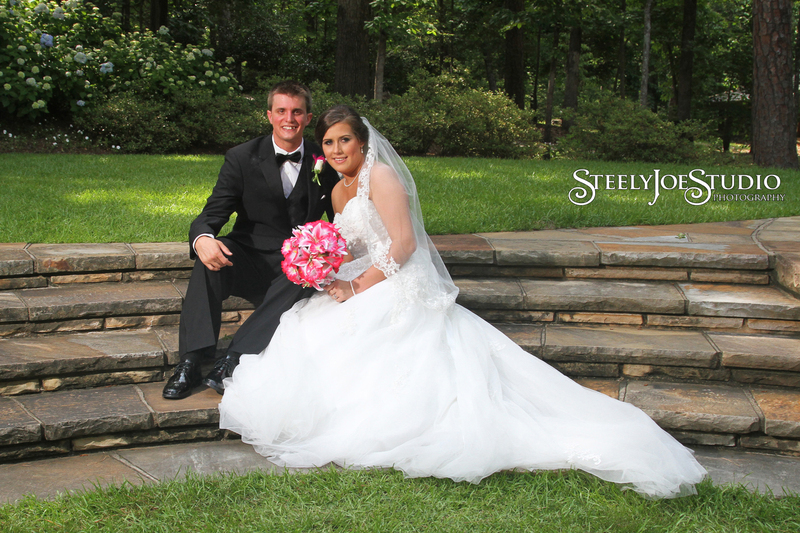 Samantha’s Bridal portraits were done about a month ago at Magnolia Gardens Inn in Springdale. Since the wedding was yesterday, I can finally share some of my favorites. You can see more on my Facebook page (see the link on the right). My usually reflector holder/train fixer (a.k.a my hubby Ed) was not available, but the brides mom did a great job filling in! There were so many blooming trees and bushes on site that it was easy to find really nice settings. We did a few shots inside the beautiful historic Inn and this shot was done using the very polished bar wooden bar top. I like this picture because is has a sort of fairy tale look to it. When I saw this gorgeous tree along the side of the house, I knew we had to use it in a shot. I had to do a little photo stitching to get the whole curve of the tree branch, but it turned out nice! Categories: bridal portraits, wedding photography | Permalink. Book before the Bridal fair for 2009 rates! Happy New Year, everyone! If you are planning a wedding and are looking for a photographer, I would love to meet you at my booth on January 16th at the Springdale convention center. The increasing cost of supplies has made some changes to my pricing necessary and the new pricing will go into effect on January 16, 2010. So call me now and save yourself some money! And don’t forget to check out my website for details on how you can “test drive” your wedding photographer. Portrait rates will be increasing slightly as well, so for those of you thinking about booking spring portraits, don’t put it off any longer! 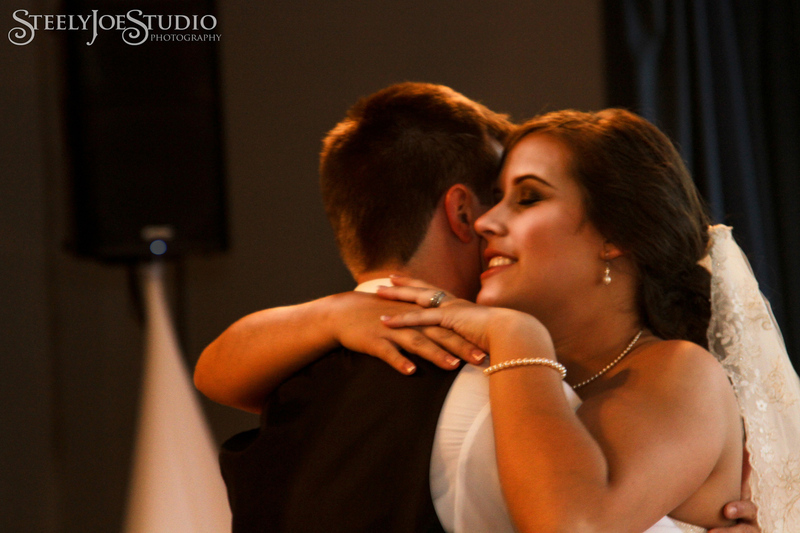 Categories: bridal, bridal portraits, engagement, portraits, Seniors, wedding photography | Permalink.